Innu culture is nomadic, and has been present on the territory for at least 7,000 years. The Innu succeeded in adapting to and prospering on the land. Stories and legends almost as old as their presence on the territory have come from this adaptation. 23:05 min. 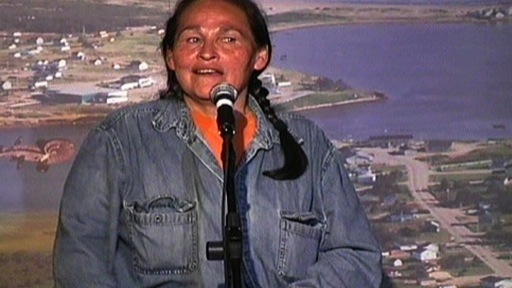 - An Innu legend recounted by Joséphine Bacon at the first Innucadie Stories and Legends Festival. This ancient legend comes from the ice age, around 10,000 years ago. This legend features animals of the North. Joséphine Bacon - A long, long, long time ago, there was no summer. There had never, never, never, never, and I mean never, been a summer. Except that there was a family who, you know, a little family, a father, a mother and their son. And the little boy had a big problem. And his big problem was the fact that he was full of lice, he had lice. Even though his mother got rid of the lice every night, there were just as many the next day. So one night, you know, the mother whispered to her husband, and said, "What if we abandoned our son?" And she said, "The lice will end up killing him anyway." So the father said, "Okay, then", you know. Maybe it wasn't quite like that, but in Innu it was more or less like that. So the father was the first to leave the next morning to look for a new camp. And you know, they lived in, in a top-quality traditional house. And in traditional houses, there's always a beam up high, you know, over the fireplace, to hang your moccasins so they'll dry. The mother got up early. And the little boy had also awakened at the same time as his mother. The little boy, you know, was watching his mother go about her business. And he looked at his moccasins perched way up high. So he said to his mother, he said, "Mommy", he said, "Mommy, give me my moccasins". And his mother replied, she said, "I don't have time" she said, "I have to pack our bags". So she packed the bags, finished packing the bags. And the little boy said to his mother, he said, "Mommy, give me my moccasins so I can put them on". And the mother replied, "I can't", she said, "I don't have time, I have to put all the bags on the sled". So the little boy waited while the mother, you know, took out the bags and put them on the sled. She came back, and the little boy looked out the door of the traditional house and said, "Mommy", he said, "And my moccasins, eh, my little feet?" And the mother replied, "I can't", she said, "I have to try, I have to put my snowshoes on." And she put on her snowshoes. So the little boy said, "My moccasins, my feet?" And then she said, "I can't", she said, "I can't, I have to try out the weight of my sled". So then, you know, the woman, she had the moccasins, she was ready, all she had to do was to give the moccasins to her boy. But no, that's not what she did. She took the opportunity to leave. So she left, you know, and she was in a hurry, and walked fast. And the little boy, seeing his mother leaving, ran after her, you know, after her. He ran, and ran, and ran, and ran, and at one point he managed, you know, to climb onto the sled but the mother pushed him off with the snow shovel and he fell off the sled and, you know, the mother kept going. But since it was still winter and the little boy was barefoot, his feet started to get very cold. So he returned to the traditional house and he cried and cried, he was so sad because, by then, he certainly did feel abandoned. And he cried, and cried, and cried. You know, he was really sad. And then, suddenly, you know, since he had left the door open, suddenly he saw a giant coming towards him from afar, a big, big, big man, a real giant. And the only giant we knew about in those days, you know, was Atshen. For the Innu, Atshen was a cannibal, not an anthropologist! At the sight of the giant, the little boy said, "Mother", he said, "Atshen has come for me". The giant was walking fast, he walked, you know, he was coming fast, and the giant said to him, he said, "Don't you think your mother is the Atshen for abandoning you?" So the little boy had to admit, you know, that his mother had left. And then the giant asked him, he said, "Why did they abandon you?" And then the little boy said, "Because I had too much lice." And then Mestenapeo said, "I'll get rid of your lice". So he sat his grandson down and got rid of all the lice, except, he said, "I'll leave a male louse, a female louse, a baby louse and an egg". He said, "That will keep the Indians busy on winter nights". The next day, you know, Mestenapeo asked his grandson, he said, "Would you like us to go and join your parents?" And the little boy, you know, he didn't hold a grudge at all. So he was happy to go and find his parents. But you know, Mestenapeo, you know, had a hole in his moccasin. He put his grandson in his moccasin so the little boy could, he could stick his head out and see everything. So they walked and all of a sudden, they saw a porcupine. He said, "Grandfather", he said, "A porcupine!" "We can roast it on a stick". Mestenapeo looked at the porcupine, but it was too young. So Mestenapeo said, he said, "We can't, we can't kill it, because," he said, "If we killed it and roasted it on a stick, it would be full of ashes". So they continued long their way, on and on, and they came across another porcupine which was the right age, it was an adult. So they burnt its quills, and roasted it on a stick, and had themselves a great snack. Then they continued on and on, till they came to the little boy's parents' new camp. When the little boy, you know, saw that they were close, Mestenapeo took him out of his moccasin and he ran towards his parents. He was so happy to see his mother again. So, when she saw her son whom she had abandoned, she wondered, "Who brought him here?" And she said to her son, "My son", she said, "Who brought you here?" And he said, "My grandfather". So then, you know, when the mother saw the grandfather who was a giant, her first reaction was also to think it was Atshen, the cannibal. But Mestenapeo could guess what the woman was thinking. So he said to the child's mother, he said, "Are you not the Atshen, for abandoning your boy?" And she didn't say a word. The little boy was so excited, he asked his parents, he said, "Can my grandfather stay with us?" And you know, it was very hard to refuse, the woman acquiesced and said yes. Mestenapeo took the shape of an ordinary man, our height, well, maybe not mine... but a normal man's height. And that was that. Mestenapeo settled in with his grandson and his father and mother. The men went out every day to hunt. And the little boy always said to his grandfather, "What would you like me to bring back for you?" Mestenapeo said, "The lungs and liver". So every day, the little boy went out to hunt, and brought back the lungs and liver. And you know, it was like that every day. At one point, you know, one morning, when the little boy had gone hunting with the men, you know, you could hear dogs barking from afar. And the woman started thinking again. She thought, "He might do something". "First", she thought, "He might get up and shut the barking dogs up". And because Mestenapeo had guessed, he got up and looked at the woman. He said, "I know what you think of me". And then he said, "I'll leave, but", he said, "Be careful not to console my grandson". And he left. In the evening, the little boy naturally came back with, you know, he was still happy. He said, "Grandfather, I've got your lungs, I've got your liver". But no grandfather, he was gone. And then, you know, then he started to cry, he asked his mother, "Where is my grandfather?" And his mother said, "He's gone." So the little boy went out, followed his grandfather's tracks, and caught up with him. He wanted his grandfather to come back. But Mestenapeo told him, "No, I can't come back". He said, "Your mother has bad thoughts about me". And he blew on him, and the little boy found himself on his doorstep, but he got up and ran after his grandfather once again. He caught up with him a second time and wanted his grandfather to come back so badly. But Mestenapeo blew on him once again. Oof! He ended up back home. The boy got up a third time, and this time, Mestenapeo decided to install his comb as a barrier between his grandson and himself. And once again he turned into, you know, the giant that he was in the beginning. So he told his grandson, he said, "You'll see me again". He said, "We'll see each other again". He said, "Make a dwelling like this, from that kind of tree". He explained how to make the shaking tent. Then he said, "If you do this, I'll always come to see you". So then he blew on him a third time. The little boy found himself home again and he started crying and crying and crying, he cried so much, he cried and cried and cried. He was really disconsolate. And the woman remembered what Mestenapeo had said, you know, to be very careful not to console their son. So you know, they were nervous, because in the old days, when an elder told you to be careful, you paid great attention to what he said, because that could bring you things that were not good for you. But the little boy cried, he really cried so much. So the people in the group to which he belonged began to get nervous. And they didn't know what to do, and they did all kinds of things to console him. But the child remained disconsolate. All of a sudden, his father went to see him. He said to his son, he said, "What would you like us to do for you, so you'll stop crying?" And the little boy cried and cried, but he said, "I'd like to hunt the summer birds". But there was no summer. There never had been, they had no knowledge of that. So they held a big meeting, a big council to decide who would try to find the summers. And all the winter animals gathered together. Caribou was their captain. Wolf was his assistant. Otter was there, and Fisher Marten all the winter animals, you know. They would go on the expedition, go look for the summers. So they walked and walked, except that someone had told them, you know, the first persons they would encounter would be two Little Owls. So off they went in the snow, and actually, they did encounter the first two Little Owls. So they asked the owls, they said, "Do you know the way to the summers?" And the Little Owls, who were half-blind and old to boot, said, "We've heard, you know, when you get close to summer, the snow is yellow and wetter". Then they said, they said, "But you should go ask Beaver, you know, "he doesn't live very far from here, and he has fat. Except that Beaver is grumpy". The winter animals decided to tickle him. So they tickled Otter until he almost died laughing. And then they said, you know, "Okay" and Otter said, "Stop, stop" he said, "I'm going to pee". You know, because he laughed so hard. So the animals thought, "He must not have much laughter left in him if he's laughing so hard he almost peed". They continued on their way and arrived at Beaver's cabin. When he saw them coming, Beaver said, "Of course, you know, visitors. I'll have to let them in". So he invited all the animals inside. They placed Wolf and Fisher Marten at the door, and Beaver took out his roll of fat... But every time he moved, he farted. And when he displaced his fat, he farted, and I know it's true. As Jean told me, Beaver was always farting. So, at one point, they had arranged things so that Otter, you know, was a bit further away, so Beaver couldn't really see him. But Otter, you understand, every time Beaver moved, you know, he wanted to laugh, so he held it in, and the others, you know, jabbed him with their elbows to make him calm down. So at one point, Beaver kept farting, and Otter couldn't stand it anymore, and you know, burst out laughing. Beaver was furious, he left with his roll of fat, but as he left his cabin, the two animals had cut the cord. And he was so mad that he didn't even realize that they had cut off what he was carrying. So he left. And all that was left were the animals, who were looking for the summers. Then they shared the fat. They didn't want to give Otter too much, because he had almost ruined the project. They kept some, you know, for the trip. So they kept going, on and on. Then suddenly, you know, they kept on going, kept on going and at one point, they came to a place where there were some Greater Yellowlegs. The Greater Yellowlegs thought, "Ah, strangers, strangers". So then, you know, they started denouncing them, you know, you know, like stool pigeons, "Ah strangers, strangers". So one of the winter animals said, "Quiet", he said. "Shut up, you know, shut up". He said, "You can't", he said. "There's a child", he said, "Who's disconsolate and who wants to hunt the summer birds". So then, you know, the Greater Yellowlegs had big hearts. So they started to shout, "Ah, it was a joke, it was a joke", so the winter people could continue along their way, and they walked some more. And at one point they came to a river. And in the river was Muskrat, who was mounting the guard, you know, he patrolled the lake because he was a sentinel, because on the other side of the river was a shaputuan where the summers were kept. You know, the winter animals didn't really know, how to, you know, approach Muskrat so he wouldn't tell the summer people that strangers were there. So Caribou said, "Psst,psst". And Muskrat turned around and said, "There are strangers here", he said, "I'll go and tell". Then he said, "Psst, psst, come here". So Muskrat approached and they offered him some fat. They gave him a little, but Muskrat found it so good that he licked his paws. And then he saw that his front paws were full, full of fat. And he thought, he thought, "The summer people will know, they'll know that I've seen strangers". So one of the winter animals said, he said, "Tell them", he said, "That you went to a place in the river "that you've never been before, and there was clay or weeds". He said, "Okay". So then, you know, the winter people bribed him with caribou fat. And they said to Muskrat, they said, "Come here." "What's going on in the shaputuan on the other side?" Muskrat said, he said, "Every night, they sing and dance", he said, "They play the drum. Anyways", he said, "They have fun". That was it. Then they told Muskrat, they said, "If you want to eat, if you want us to give you more fat", they said, "Will you do something for us?" So Muskrat, who was, who loved fat, said, "Yes, but it depends". He said, "What?" So the winter people said, "Go, chew up the summer people's canoes and their oars." Then they said, "Tomorrow morning", they said, "Put a stump over your head, and", they said, "Cross the river". So during the night, while the summer people celebrated and danced, and, you know, played the drum, they sent Gray Owl to see what was going on in the shaputuan. So you know, he went, he made it there. And right there in the shaputuan, was a hole. So he peeped in through the hole, and at one point, one of the summer people, you know, noticed, you know, that something was sticking out. "Ah", he said, "It must be a stranger, a spy". So he picked up a firebrand and burned the owl's beak. That's why, you know, his beak is somewhat like this today. It's because, you know... but he held on. He suffered and suffered but he held on anyways. And at one point, you know, the dance continued. He went back to the winter people. And they said, "Where do they hang the summer birds?" Owl said, "At either end, at either end of the shaputuan". So now, you know, they knew where the summer birds were hanging. Meanwhile, Muskrat, in order to get more fat, had chewed away the oars and the canoes. And the next morning, when the summer people had finished celebrating, Muskrat put a stump full of branches on his head. It looked like moose antlers. But you know, the two old Little Owls were watching. And when they saw the Muskrat go by with his stump, because they couldn't see very well, they thought they'd seen a moose. So they began to shout, they said, "It's our moose crossing". And all the summer people, you know, came out, they got into their canoes, took up their oars, and left, you know. Then, right in the middle of the river, they sank. During that time, the people, the winter people, could go ahead and steal the summers. So they left, you know, and Wolf and Caribou, the fastest among them, ran ahead. And the summer people came back, they said, "Someone is stealing our summers". But they couldn't catch up with them. So then they said, "We'll take turns having summer and winter". So, so, everybody agreed, but they needed to know how long summer would last and how long winter would last. So Toad, with his palmed feet, decided that there would be six months of summer and six months of winter. So everyone agreed and they left. As they got closer and closer to the disconsolate little boy, you know, they let, they freed the summer birds. And when they arrived at the little's boy home, summer had come. So the parents made him a bow and arrow, and he hunted the summer birds. He hunted so much that he almost decimated them. The summer birds said, "If he keeps on hunting us like this, he'll decimate us". So they said, they invited him to become a summer bird. And that's why there's summer today in Innucadie.